Chicken or the Egg? Business or the home? Which came first, the chicken or the egg?Â People with too much time on their hands have laid out a detailed argument here. For this post I am more interested in a question similar in nature.Â Which came first, the home or the business? The reason I pose the query is because a recent news story on my favorite radio station once again mentioned â€œjob centersâ€ with regards to the NorthSide development.Â From what I have heard and read, McKee and associates plan on concentrating on job centers to begin the massive project and work on residential in the future.Â Â I do not understand why.Â If their goal is truly to redevelop north city, I do not believe job centers are where to begin.Â Residential is where they should start, because to answer my own question, I believe the home came first. I base my view on what I have observed spending a lifetime in suburbia.Â A look back at the history of the region sees that the homes almost always come before businesses.Â North county grew in the post war years due to massive amounts of housing developments.Â The businesses moved in after.Â Just compare north Lindbergh between now and twenty years ago. The migration of the suburbanites to St Charles county preceded the explosion in retail.Â To understand what I am talking about, try driving down Highway K, which was a two lane road fifteen years ago.Â West County filled in with soccer moms and SUVs before Target and Best Buy decided they needed stores in a flood plain. There is easy explanation for why businesses will always follow homes.Â In the words of Mr. Gekko, â€œGreed is good.â€Â Businesses are for all intent and purposes greedy entities.Â They are only open of the pursuit of money.Â Otherwise they are called non-profits.Â Stores want to be where the people are located so they can make as much money as possible.Â Which is they Home Depot has a store on Highway K and not Cass ave.Â Businesses do not need tax incentives to open in locations where there is significant money to be taken from consumers.Â Entrepreneurs know that if they donâ€™t open a store in prime locations, their competitors will. This view of the world leads me to conclude that the starting point for the NorthSide needs to be massive residential development.Â I am well aware that homes currently exist in the area.Â Obviously these are not homes a majority of people want to live in.Â If they were, they would have premium pricing, not rock bottom.Â However, an immense fill-in of new family housing would be impossible for greedy businessmen to ignore.Â Job/retail centers would be easy to develop without much government assistance when Trader Joeâ€™s wants a store in the area.Â Â Set those areas aside for future development when it is needed. I assume that the residential development would be an urban style and walkable, but those details are moot.Â What is important is the size.Â Repeat the example set forth by the suburban subdivisions and build hundreds of homes at once in an urban setting.Â View it as a giant planned community.Â Few people want to be the first on the street staring at overgrown lots with a promise of more to come.Â Seeing homes being built all around would ease some of those fears.Â This would only help the existing residents as they see their home values rise.Â (In my world it is done the right way, without taking peoples homes, but rather building around them. )Â An example of this done on a small scale with success can be seen in the West End just north of Delmar on Enright and accompanying streets.Â Now I don’t agree with some of the design choices that were made, but a group of new homes were built and sold for a premium price.Â This demonstrates that there is some demand for new housing in the city. I am aware that the planned job centers are intended to have mixed residential sprinkled in the plans.Â However, from everything I have heard and read I get the feeling that the mixed use areas are not Paulâ€™s prime concern at the outset.Â Lets just ignore that city schools are currently a hindrance to any residential growth and concentrate on whether McKee should spend time building job centers or homes. For less than 20 years 33 towers stood on 57 acres on the city’s near-north side (map).Â Pruitt-Igoe was a failure of massive proportions. The reasons are numerous and complex.Â The towers were razed over a two-year period starting in 1972.Â Since then the site remained (mostly) vacant. I continually hear people make the false claim the site has remained vacant because of the old foundations that were left in place.Â To debunk this often repeated myth I turned to the person that would know best: Martin Braeske. Each tower had a partial basement for boiler and mechanical systems equipment. The ones we found were intact and simple filled in with dirt. We dug them out, punched holes in the bottom to equalize the water table and demolished the walls to about eight feet below the finished ground level. While this did cost a bit, it is not a major deterrent to redevelopment of the site. The federal judge overseeing the area’s school desegregation program is giving the St. Louis Housing Authority two weeks to hand over part of the old Pruitt-Igoe tract as the site for a $30 million magnet school. U.S. District Judge George F. Gunn Jr. noted in his order that the federal court last year had approved the Pruitt-Igoe location as the site for the Gateway School. In May, the St. Louis School Board filed an application with the Housing Authority to acquire 18 acres at Pruitt-Igoe, a public housing complex demolished in the 1970s. The authority owns the property and the U.S. Department of Housing and Urban Development has a lien on the tract. The Tenant Affairs Board, which represents public housing tenants, opposed the deal. It contended that under federal law it has the “first right of refusal” in land transactions that affect public housing tenants. Gunn disagreed, at least regarding the Gateway case. In an order late Wednesday, he said the tenants’ board cannot block the Pruitt-Igoe deal. He pointed out that the site is a “vacant debris-strewn area” that has had no residents for more than 15 years. He ordered the Housing Authority to disregard the tenant board’s intent to develop the site the School Board wants for Gateway School. The remaining 39 acres are still vacant 15 years after the school opened, becoming an urban forest.Â Interest in Pruitt-Igoe remains as strong as ever.Â Local filmmakers are hard at work on a documentary on the project.Â See their site at Pruitt-Igoe.com (under construction) or follow them on Twitter @PruittIgoe. My name is Phil Bosch. I’m an artist based in Holland who is coming this Oktober and November to St. Louis to work on a special video documentary project.Â I would like to investigate the memories of former residents of the now defunct Pruitt-Igoe housing complex. For the citizens of St. Louis this place is still an open space in the city, like an inverted monument of a history that seems to be forgotten. Slowly this housing complex seems to have taken on a mythological status.Â Â My film will be a study on its mythological status on the one side and the realm of experiences of the former residents on the other. The goal of my project is to enter, imaginatively, this huge building complex, even though its physical appearance is no longer there to be seen. While the Pruitt-Igoe no longer exists physically, it still exists in the memory of the former residents. It appears that despite the negative aura of the complex (the death of Modernism, the site’s history of crime and vandalism), there is still a coherent social group in the area who meet regularly. Thus, my goal would be to search for memories of a place where many lives were connected by this architecture that no longer exists. I would like to document these memories. First of all, I would like to video the site of Pruitt-Igoe, which now has been taken back by nature. Next, I would like to contact people who had lived there or who otherwise have memories of the buildings. If you can help Mr. Bosch email him. 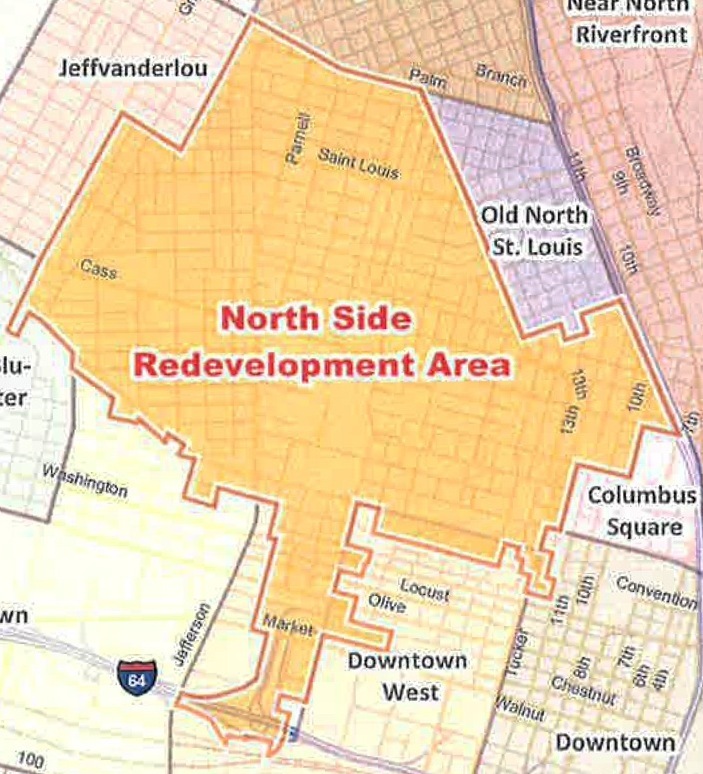 Paul McKee’s NorthSide project may, eventually, be a good thing for the City of St. Louis and the entire St. Louis region.Â But by that time most of us won’t be around.Â We’ve had a 60+ year decline (1940-2000) and it will take at least 60 more to recover (2010-2070) from numerous past mistakes. Looking at unused land (Pruitt-Igoe, 22nd Street Interchange, etc) as potential job centers connected by tree-lined boulevards and transit is sound urban planning.Â But good urban planning in the community is best done by the community, not the private sector. Famed planner (engineer actually) Harland Bartholomew guided much of the destruction of the city during his tenure, 1916-1950.Â He rejected everything Jane Jacobs valued in cities. A summary statement of the research findings and policy implications of a series of studies conducted under the St. Louis project of the RAND Urban Policy Analysis Program. Three possible futures for the city are posed: continued decline; stabilization in a new role as an increasingly black suburb; and return to a former role as the center of economic activity in the metropolitan area. 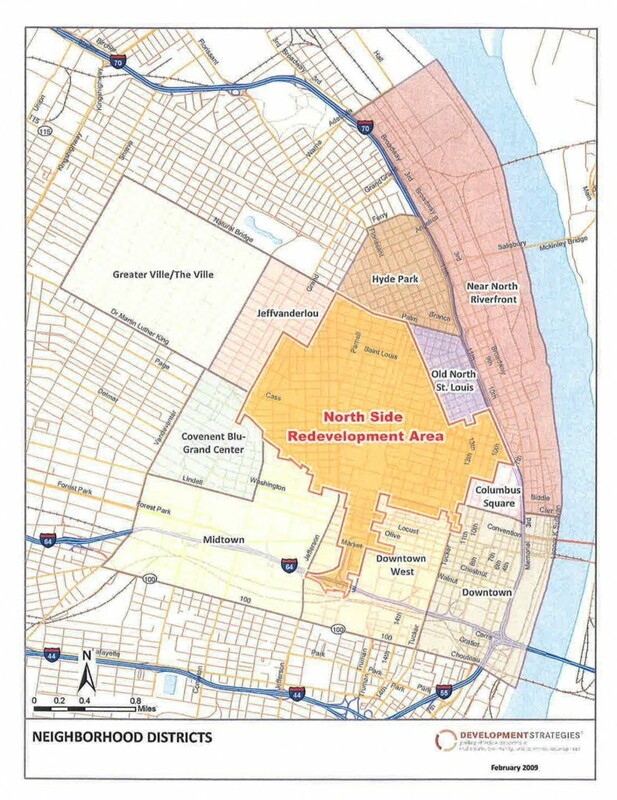 The analysis argues that without major policy changes beyond the local level, the city will most likely continue to decline, and suggests that, among the alternatives open to the city, promoting a new role for St. Louis as one of many large suburban centers of economic and residential life holds more promise than reviving the traditional central city functions. However, new resources, available to the city from sources outside the city, are essential to any improvement. Several mechanisms are offered for consideration: (1) a more substantial federal revenue-sharing program; (2) a state revenue-sharing program to support selected public goods; (3) a metropolitan revenue program, sharing revenue generated by industry in the metropolitan area; and (4) a metropolitan earnings tax. This report shocked city leaders. The planning commission hired a consulting firm to update the 1947 Plan and to reverse the decline cited in the Rand Report.Â The draft 1975 INTERIM COMPREHENSIVE PLAN was the city’s response. The Interim Comprehensive Plan was introduced to the public as a replacement of the 1947 Comprehensive Plan . The City Planning Commission claims that the planning needs of St. Louis had changed over a period of thirty years and therefore the comprehensive plan for the City should change as well. This draft document was written for citizen review. The overall focus of this comprehensive plan was to provide citizens with the highest quality of life, socially, economically, and physically. The plan contains policies and recommendations for land use, transportation, public facilities and housing, all of which are aimed at establishing a quality residential environment, job opportunities, economic development, and expanded opportunities for the disadvantaged. This never adopted draft plan is best known for the firm the wrote it, Team Four. The Team Four plan was urban triage — cutting off municipal services to those areas deemed too far gone.Â Save what can still be saved.Â Today this approach is applied to shrinking cities.Â Â Back in the day it was viewed as a plot to drive black citizens out of the city. Many still feel that was the intent or would have been the result if the plan would have been officially adopted. After the backlash against the Team Four plan the City of St. Louis got out of the big picture planning business kicking off the second 30 year period without a plan. We look to the government to provide services where the private market has failed or those for the common good, such as fire protection.Â But three decades of government being out of planning the primate market reversed the roles and developed their own plan.Â Of course the private market’s main goal is profit. Today’s residents, many not born when the city gave up on planning, are not willing to turn over community planning to a private business.Â I don’t blame them.Â So the first part of the mess is the city’s abandonment of planning.Â Next is the realization that a businessman from St. Charles County wants to do the planning the city should have been doing.Â Of course, the city has a poor track record of planning. But the citizenry had an ideal of community planning so when McKee purchased thousands of properties people naturally got suspicious of his intentions.Â Numerous meetings this year announced those intentions but poor community & media relations has made a bad situation even worse.Â Myself and others of the media were barred from a meeting, a discussion board was set up by McKee’s company only to be taken down due to a mountain of criticism.Â Uh, duh. Tonight McKee is asking for public TIF funds to help finance his project yet a few days ago, at a public meeting, he objected to his statements being recorded on video.Â In decades earlier deals could get done without such documentation by the public.Â But it is 2009, not 1959.Â Cameras are a fact today and public meetings are subject to being recorded.Â Holding meetings in private to circumvent this reality is even worse.Â Our elected leadership is not equipped to manage the conflict. Parts of McKee’s plan are sound: developing the vacant Pruitt-Igoe site, using wasted land at the 22nd Street Interchange, planning for jobs at the landing of the new Mississippi River bridge, narrowing Jefferson Ave, and building a streetcar to tie the near North side into downtown, filling in gaps in the urban fabric.Â Had these ideas come out of a community planning process most would be on board today.Â Instead we have a huge mess with a substantial section of the city hanging in the balance. 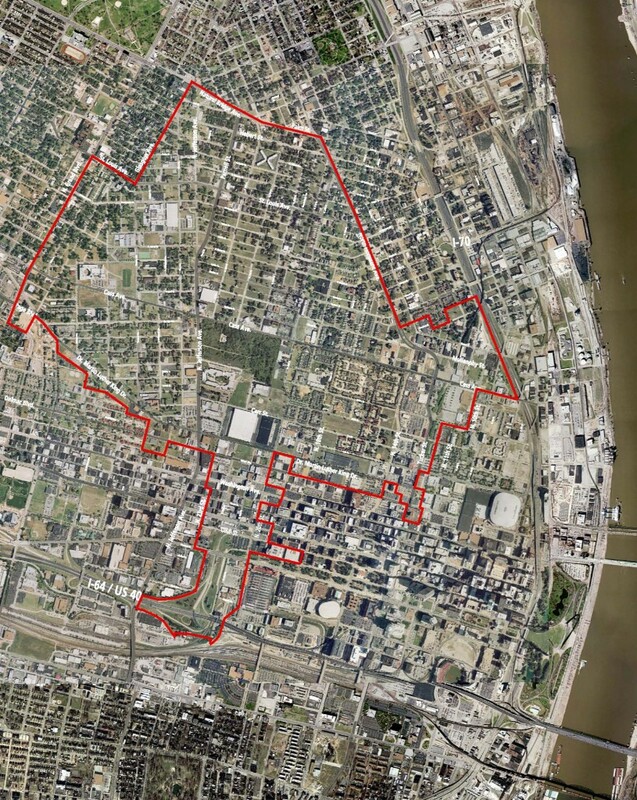 I’m not sure which is worse; Harland Bartholomew’s highly planned destruction of 19th century neighborhoods, a 30-60 year gap in planning, or planning serving private interests.Â None will lead to the city I envision St. Louis becoming. Pyramid, the company proposing a highly suburban McDonaldâ€™s for South Grand, has dumped an atrocious housing project on the cityâ€™s north side. Forget the high-profile loft projects downtown, Pyramid is making a name for themselves with suburban rubbish throughout our once urban neighborhoods. Full post from March 18, 2006: Pyramidâ€™s Sullivan Place Senior Housing An Anti-Urban Monstrosity. 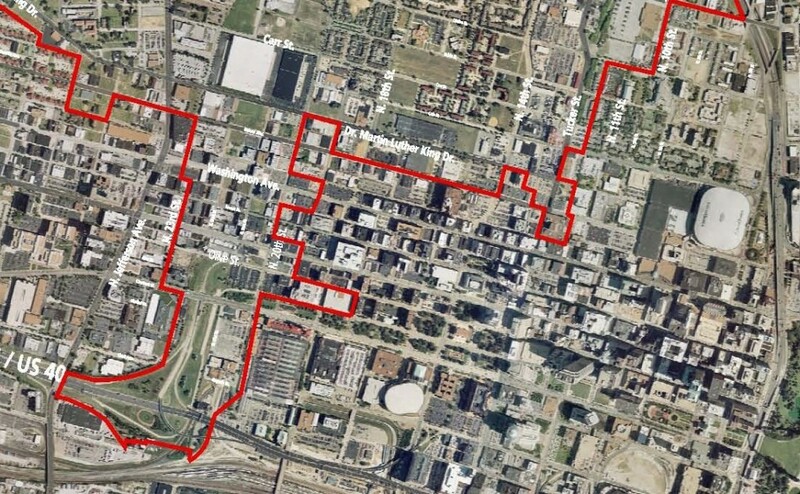 Gee, can you figure out which structure is Sullivan Place? Makes me cringe.Â Â It borders 3 streets but doesn’t relate to any of them.Â I’d love to see McKee’s project take this heep and restore the street grid.Â The project gets its name from the street that was closed — Sullivan.Â We are likely stuck with this place until it falls apart.Â See my 20+ photos of Sullivan Place from March 2006 here. Update 6/10/09 @ 9:10am — Headline alaborated.